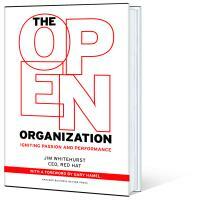 The Open Organization: Igniting Passion and Performance is a 2015 book by Jim Whitehurst, CEO of Red Hat. Written primarily for organizational leaders, the book demonstrates how open source principles like transparency, authenticity, access, and openness are changing the nature of working and managing in the 21st century. See "What is the Open Organization?" to learn more. Why did Jim write the book? The Open Organization shares leadership lessons Jim learned as CEO of an open organization. As he puts it: "When I first joined Red Hat from Delta Air Lines, I had a traditional perspective of the role of a corporate CEO. That was the person in charge—no questions asked. In fact, when I was at Delta, I was the quintessential 'top-down' manager. Red Hat changed that—dramatically." The book offers advice for leaders seeking to adapt their organizations to "today’s enormously fast-moving technology climate." Several retailers carry the book in both paper and electronic form. Kindle users unable to purchase the book from Amazon can acquire copies of The Open Organization in .mobi format directly from the publisher. As Jim explains, "pursuing a traditional book publishing model would best help us achieve our objectives: distributing The Open Organization as widely as possible, and growing the community of leaders with whom we hope it resonates." Red Hat does not profit from sales of the book. All procedes benefit the Electronic Frontier Foundation. Where can I discuss the book? The Open Organization has spawned a vibrant community of readers interested in putting Jim's principles into practice. Opensource.com regularly publishes stories about open organizations. You're invited to submit yours! You can also participate in the conversation on social media using the hashtag #TheOpenOrg. Follow @OpenOrgBook on Twitter and join the Facebook community. We also encourage you to form your own Open Organization book club or reading group to explore the book's ideas. To get you started, we've created some book discussion materials. How can I talk to Jim about the book? Jim loves hearing from readers and sharing ideas about open organizations! You can send him your questions. How can I read the book in my native language? Currently, The Open Organization is available only in English, but the book's publisher, Harvard Business Review Press, is assessing the viability of releasing it in additional languages. Let us know how you'd like to read the book. While it originated in the context of computer software development, today the term "open source" designates a set of values—what we call "the open source way." Open source projects, products, or initiatives are those that embrace and celebrate open exchange, collaborative participation, rapid prototyping, transparency, meritocracy, and community development. See "What is Open Source?" to learn more.